Bonita Takes a Last Lap Victory! 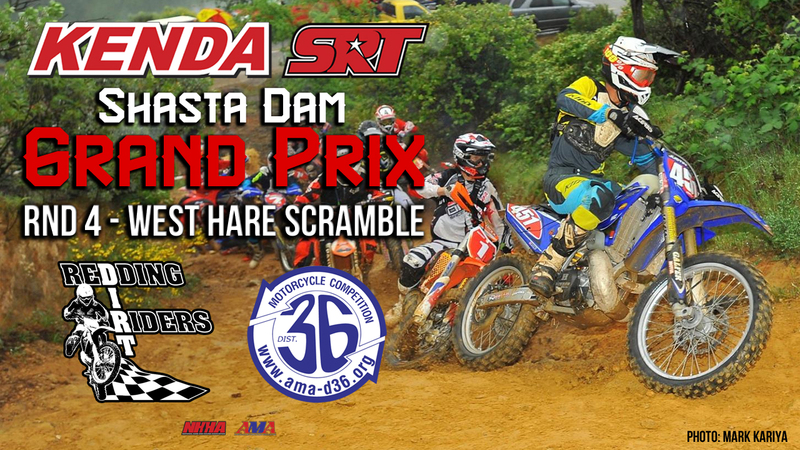 Shasta Lake, Ca: The 2016 Kenda/SRT West Hare Scramble Championship has been a wild one this year with a different overall victor every round. This weekend would be no different and with the added challenge of rain through out the night making for very wet conditions. With over 500 racers on hand and the Redding Dirt Riders ready to host Round 4 of the series we would see another great race weekend! The races would start early Saturday while the conditions were still bone dry. The Pee Wee’s would be the first racers to take the course and they would have a great battle on their hands. At the drop of the flag series points leader Elizabeth Edwards would get around the first corner ahead of the rest of the field but by the end of lap one South San Francisco’s Cody Ward had taken over. The top 6 were all within 30 seconds giving Ward something to push for! Wyatt Burns would maintain the pressure on Ward for the first 4 of 10 laps and Ward would get no further then 30 seconds in the lead before the checkered flag. Burns would cross in 2nd and now sits 2nd in points followed by Protaper/Matrix backed Lowe Lord. Cody Ward and his entire crew rocked the tuxedo t-shirts all weekend long! After the local Pee Wee C’s got done with their 30 minute battle the Juniors were up next! Jr. Mini and Micro Mini racers would take to the much longer, much more technical 8 mile course. While the Micro Mini’s are on the smaller machines it was once again FMF/DTI backed Talan Van Valkenburg overtaking the bigger bikes by the finish of the race from a row behind. Garrrahan Off-road Training’s Wyatt Mattoch wouldn’t make it easy for him finishing just 6 seconds back after the full hour and a half race. Mattoch’s team mate Tallon Marshall would round out the podium in the Micro Mini class finishing just 2 minutes shy of the lead duo. Talan Van Valkenburg would tally another win on his way to a dominating points lead. Santa Cruz Cycle Imports backed Shane Heywood would earn his first Jr. Mini victory of the season taking the position from Jessy Ward after the first lap. Talan Turlow would follow in 3rd after coming back from a horrible first lap. The final points paying race of the day would see another epic battle between Thousand Oaks Powersports backed Mason Matthies and the Six Five-O KTM 105 of Mateo Oliveira. Into the first corner Mason would take early control of the race and do what he could to stay ahead of Mateo as he was definitely out of his element. “It was good to be in Gorman at the last Round and get out of the trees and mud. I’m not really good in any of that stuff…” admitted Mason. He would do what he could but on the 2nd lap a crash in a corner would let Mateo past and he would take over from there. “I just rode smart and stayed off the ground and that was it. I really didn’t know he was that close on the last lap.” recalled Mateo as he would leave on the final lap just 10 seconds ahead of Mason. A consistant final lap would keep him just over 30 seconds in the lead all the way to the checkered flag where he would take over the points lead. Polka Dots MC’s Lochlan Cambpell would over come a Round 2 DNF to take the podium for the first time this season. Brandon Stoffel would cross the finish in 4th followed by 707 Suspensions Logan McChesney in 5th holding onto 2nd in the points championship. Six-Five-O’s Mateo Oliveira took the win and the lead in the points championship. Through out the night the rain would start to come down and would completely change the face of the race. All the red dirt would turn to clay and goggles would be all but completely useless but the riders were still chomping at the bit to get racing. The first race of the Day would feature the PRO, A and B racers in a flip/flopped schedule and Bell/FMF/KLiM racer Justin Bonita would get the holeshot followed by the entire field right on his heals. 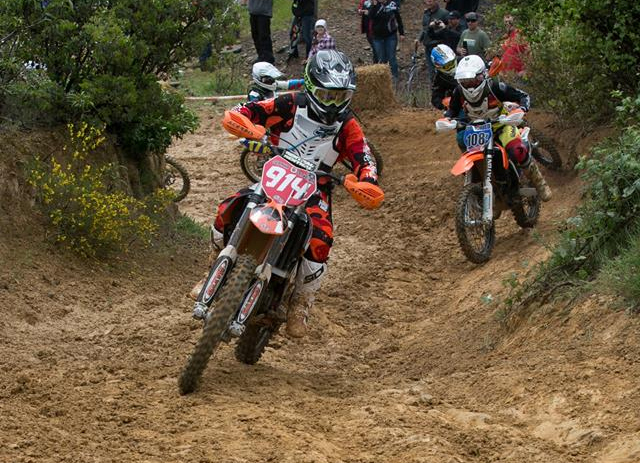 Reigning series champion Cory Graffunder aboard his Team SRT KTM 300 would make the first move into the lead. The top 8 all stayed within the same minute after their first 43 minute, 18 mile lap. While Graffunder and Bonita would stay glued to each other, swapping positions and never being more then 10 seconds apart at any given time the rest of the field was scrambling for positions. Motorsport Hillsborough Suzuki rider Kevin Rookstool would push his way into 3rd after battling with Nor-Cal KTM’s Chaz Halbert and Sierra Motorsports KTM’s Joey Fiasconaro for position. Once there he would have a smooth ride all the way to the finish. Rookstool sits in 4th in points after missing Rnd 3 to race Super Enduro over seas. On the final lap, after having an identical 3rd lap time Graffunder and Bonita would head out on course and everyone would wait to see how it would unfold! “I knew I was faster then Cory [Graffunder] and now as the time to make it happen.” said Bonita recalling the start of the last lap. “I just pushed him till I could find a spot to make the pass.” He would also have some luck on his side as Graffunder would make a costly mistake. “I got pinched off by a lapper and then went off the end of the trail.” Graffunder conceded “when I went to get up I had a stick stuck in the front brake and I had to take care of that and Bonita was gone.” After that Bonita was in charge all the way to the checkered flag. Graffunder would settle for 2nd overall after a costly mistake on the final lap. The FMF Pro 250 class would bring the excitment as well coming down to the final second, literally! RPM/KTM’s Dante Oliveira would get the holeshot but a race long battle with Team SRT’s JT Baker and Dustin McCarthy would ensue. Baker would take the lead going out onto the final lap whenere Oliveira would get by him just before the finish and crossing the line 1 second ahead of Baker. 707 Suspensions Max Parker would battle it out with team mates Dillon Sheppard and Jonothan Godman to finish on the podium in 3rd. Dante Oliveira extended his points lead over Max Parker with his 3rd win of the season. The final race of the day would see the course get shortened in it’s destroyed condition but a bit better weather as the rain had stopped and the fog and burned off. Each row, beginning with the Women’s A and B, would have to traverse the same tricky start corner and each row of Race 2 would see a delay to clear the start. This would really seperate the classes and make the overall win one that was tough to follow. Into the first corner Garrahan Off-Road Training’s Sophie Oliveira would get yet another holeshot and run away with yet another race. Leading from wire to wire over Team SRT’s Sharon Mowell, her fiercest competitor this season, she would cross the finishline physically with the lead. On adjusted time however it would be ANOTHER Oliveira family taking the top spot with Cycle Imports backed Michael Oliveira taking both the C 200 win and the overall by a mere 6 seconds over C Open Winner Erik Richards. Sophia Oliveira would take another Women’s A win ahead of Sharon Mowell and Olivia Francis. Photo Cindi Fears.